In Morocco protected animals, plants and products can be bought easily everywhere. The purchase of such souvenirs is substantially part of the destruction of the diverse life on our planet. The problem is: trade with animals and plants is a very lucrative business, as even tourists like to take home exotic souvenirs. A lot of animals die already during transport or shortly after arrival. Some of them are confiscated at customs. Protection of species includes measures to protect the wild animals and plants in their natural environment. Our aim is to contribute in the protection of the variety of species and save extremely endangered species from extermination. Therefore we have to protect especially their natural environment. The extermination of species does not have a natural cause. It is the responsibility of the human race. The main reason in Morocco is illegal trade with animals and plants. The list of endangered species, which has existed for 40 years, explains the degree of threat awaiting us. That’s why immediate help for the endangered species is required now. 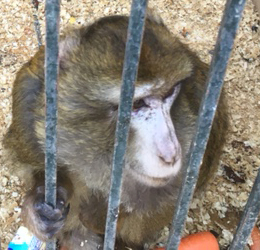 The Berber monkey’s home is Morocco and Algeria; those monkeys are in great danger and on the list of endangered species (IUCN). 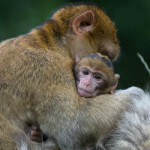 If the Berber monkey has any chance of survival, his last retreats must be protected immediately from being destroyed. Because of his intelligence and ability to speak, the grey parrot became one of the most favourite bird species. Those are also the reasons why this animal ends in captivity very often. Which makes it a popular animal for illegal trading? 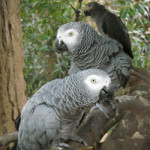 The grey parrot is listed on the CITES records. 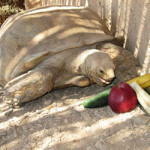 The tortoises adjusted themselves very well into their natural environment and secured their survival until today. Only through human influence many of the species are in acute danger. 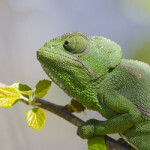 Both those reptiles exist in Morocco, but their habitat is more and more in danger. They are listed on the Washington treaty of protection of species. I was born in the woods of the Atlas mountains. We had been a happy group until the hunters showed up. They killed our mothers and we were smuggled to a town called Marakesh. There our martyrdom began. Under violent circumstances we learned to do somersaults. Day in and day out we had to make money at the place “Djamel el Fnaa”- by cheering up the tourists. One day I got a real bad beating with a stick, my back was aching and I couldn’t do my acrobatic tricks any more. The animal tamer got very angry and kicked me and I had to crawl into a very small box. This became my home – for many years. But in the end I was lucky! Some Monsieur noticed me and made a big scandal because of me. I was freed from my prison and they took me to the hospital. At the moment I live in a dog kennel and a friendly man gives food and water to me. I also have a name now: poor Boy! There is hope, because I heard that I am supposed to go to the Sanctuary of the Fondation. Unfortunately my new home has to be built first, as there is no free space for me right now. I am so lucky! I will have new monkey friends and fresh food and water there! Please support rescuing me! You can help by donating money in order to build my new home at the Sanctuary as fast as possible. Thank you, yours Poor Boy!